The eighth in the massive Mario Kart series, Mario Kart 8 lands; for the first time in high definition thanks to the technological prowess of the Wii U. Once again the series continues to innovate and add features and tracks never seen before in the series; Mario Kart 8 for the first time introduces tracks where the player will have to contend with driving upside down in karts that can defy gravity! 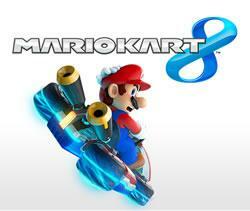 Playable characters in Mario Kart 8 include Mario, Luigi, Princess Peach, Princess Daisy, Yoshi, Koopa Troopa, Toad, Toadette, Wario, Waluigi, Donkey Kong and Bowser. Other popular characters from the Super Mario Universe that you may notice in the game but are not playable characters include Super Piranha plant, Goomba(s), Boo(s) and of course still loyally serving the Mario Kart world - Fishin' Lakitu. The First Mario Kart game to introduce upside down tracks and karts that defy gravity resulting in track designs that could never have been imagined in previous Mario Kart titles. I can see that where other Mario titles failed to make us physically sick (Nice try Mario's Time Machine) this one may have a good go at it! All the best parts of Mario Kart 7 such as the return of the hang-glider, and racing underwater; added to the motorbikes and stunts that can be performed in the air from Mart Kart Wii. The Mario Kart series finally starts to better harness the waves of social media with its ability to auto generate race highlights and submit them on the Miiverse to share with others. Returning popular characters from past titles include Waluigi and Toadette who are back in the drivers seat and ready to tear up the tracks. Noticeable improvement to even Mario Kart Wii, this is the smoothest and best looking Mario Kart yet by a long way - full high definition graphics and smooth high frame rates.